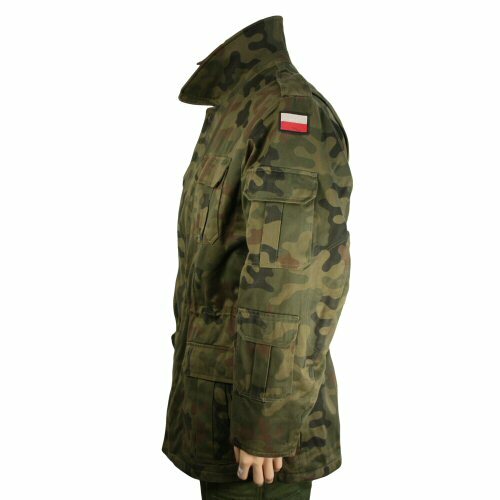 Genuine Polish forces issue thick winter parka with a heavyweight poly cotton fabric outer shell in Polish woodland camo, integrated polyester quilted lining and additional, removable polyester quilted lining. 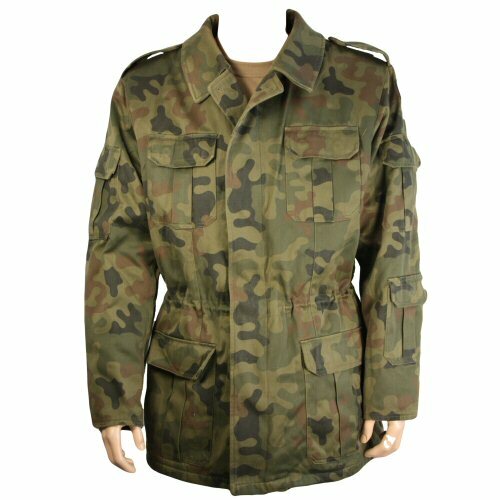 The double lining makes for very warm winter jacket for walking, outdoor observation, fishing and camping. 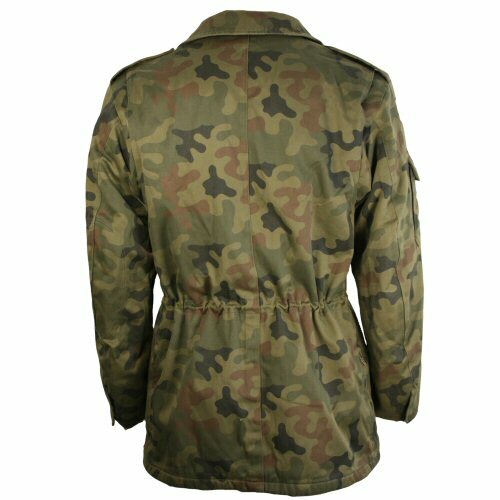 The jacket has a traditional collar and buttons up on the front with buttons hidden behind a storm baffle. 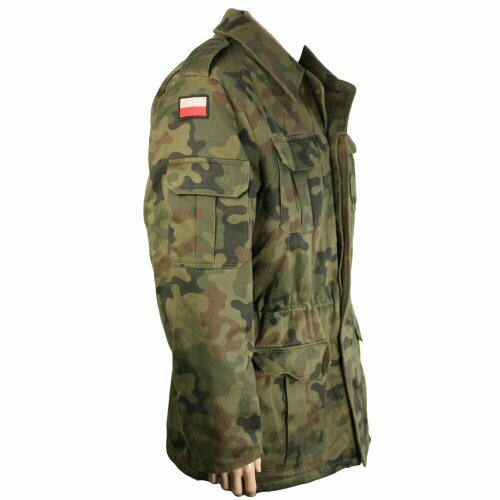 The jacket can be drawn tight on the waist and the double lining also has elastic for gathering close to the body at waist level. 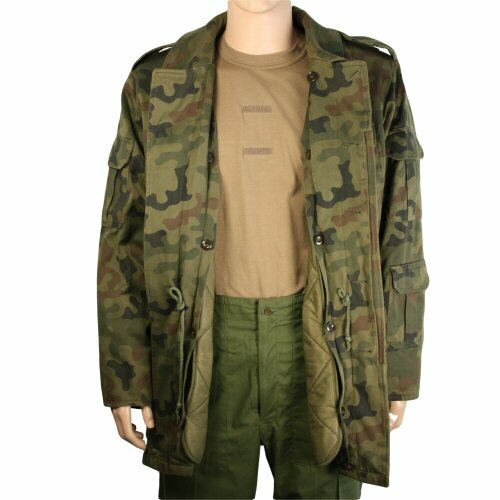 Pockets on the jacket include two chest pockets, two waist pockets, two upper arm pockets and additional lower left sleeve. The upper back has expansion pleats on the upper back. Additional features include epaulettes and Polish flag insignia, although military unit insignia has been removed and may have left some marks if these were ironed on. Sleeves close with a button. Zips on left and right sides allow for quick access to belt worn holster or other kit. All parts are machine washable. Quilted liner buttons into the sides of the jacket. Excellent winter jacket with a large variety of storage options. Chest size for 36 is 92cm, length 178cm. Available options are: 39 , 36 , 41 , 44 . 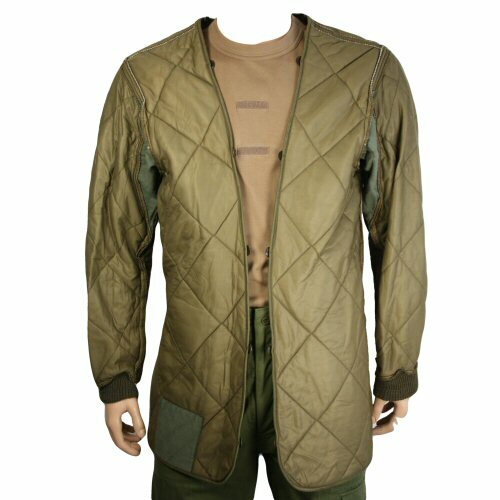 Side view of the jacket, with the collar turned up. The upper back has expansion pleats and the skirt has a zip open slit to enable quick access to trouser pockets. The right side of the jacket. The detachable liner on its own. Underarm areas are not insulated with quilted polyester to reduce build up of heat and moisture. The jacket shown open with the waist drawstrings and detachable liner buttoned in place.